It may come as no surprise that the world of marketing is changing – but don’t worry, it’s for the better! Since 2006, inbound marketing has been changing the way we apply our efforts in order to keep up with the evolving customer behavior. In today’s post we want to illustrate 10 steps on how you can transition your company to keep up with inbound marketing. Just because outbound marketing efforts are a little outdated doesn’t mean there aren’t some good ideas in there. If your business uses commercials, print advertisements and / or direct mail for their marketing tactics then re-position them for an inbound marketing campaign. Embed hashtags in your advertisements, attach a landing page to your print advertisements or direct mail (this can be done through a QR code or including a URL). Merging new inbound tactics with old outbound tactics will help you save time and money – and ultimately create a highly successful campaign. The best inbound companies start by warming up their writing skills. At the moment, it’s all about creating high quality content in order to provide value or be found online. If it isn't your area of expertise there are plenty of resources you can utilize to help you produce great content. Copy is the heart of your web presence so make it count. We totally get how tough it can be to create valuable, relevant content – but trust us, it’s worth the effort. Try writing about current, relevant events – be informative and original. If you’re struggling to find a starting point for your content, look no further! Write a case study or the top 10 inbound Twitter accounts or feature an upcoming event that is relevant to your company. The possibilities are endless; you just need to get creative. We highly recommend creating an editorial calendar where you can display topic ideas, deadlines and specific keywords – you can also delegate an author. Start assigning different topics to different members of your team to ensure variety and a content team effort. We know, we know… Being patient is hard! At New Breed, we are go-getters, so being patient isn’t one of our favorite things. But if you want to be a successful inbound company, you need to understand that “patience is a virtue,” and you will be rewarded! When you go inbound you’re not just flipping a switch – you’re empowering your employees, transitioning all the work you previously put in and taking charge of your future. It’s a huge change – but we can speak from experience, it’s for the better – embrace it! One thing you should know is people don’t always understand what inbound marketing is at first, and why it really is important for driving results. Our friends at HubSpot couldn’t have said it better – “Because like anything hard, it takes patience -- so sometimes, the natural thing to do is to water it down and oversimplify it. It gets transformed into an action, like writing a blog post or sending an email. It's hard to understand at first how something that seems so simple can transform an organization from the inside out." Marketing is always evolving so work as a team to better understand how inbound can work for your company. At New Breed, we love getting help and support from HubSpot! 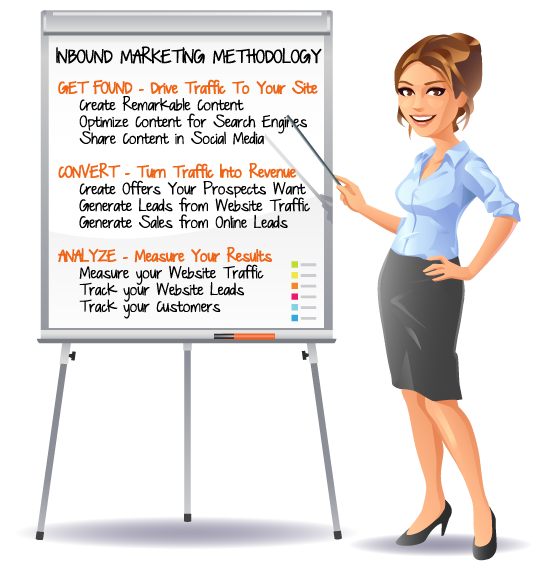 HubSpot is an inbound marketing software platform that helps with inbound marketing. Struggling with attracting leads and converting them into customers? – No problem, get some support from HubSpot or a local agency, like New Breed! Both can help you reposition your marketing efforts so you can start excelling as an inbound company. HubSpot also offers an academy! You can gain insight into all things inbound - and certify everyone at your company! New Breed is proud to be among the certified inbound companies - and we encourage you to get educated too! Get your creative team together and start brainstorming on how you can increase your social media presence and reposition it for inbound success. Your audience is online, so you should be too. Social media encourages a two way conversation that customers are intrigued by.Be consistent and reliable – answer any questions, feedback or concerns –and be sure you are updating your presence daily. Can’t convince your team to transition from outbound to inbound? – All they need is a little convincing! First off, blogs are the new cold call – blogs are more effective because they aren’t intrusive, awkward and they feel more natural. Blogs are highly effective because people seek them out, they aren’t forced on the consumer and you can guarantee that you will not be intruding on a sit-down-dinner or busy time. Print ads vs. CTA’s – Your employees will be excited to hear that a CTA can be modified if it’s not working correctly, unlike print ads – once they are printed they stay that way. Smart CTA’s will also recognize if a person has already bought or downloaded it – so they can start seeing new material. With all of these inbound tactics – what’s not to love? – All you need to do is highlight the benefits and your team will start feeling more confident and excited about the transition. Marketers are busy people, and so is their audience – sometimes we don’t have as much time as we would like to read through a blog. That’s why visual content is so effective! At New Breed, we are a little fixated on letting infographics tell a story. Infographics present a visualization of data that display important information in a way that can be quickly consumed. Infographics also attract an audience because (if designed correctly) can be very aesthetically pleasing. When designing or selecting an infographic to feature on your blog make sure it captures your target audience – to ensure they will return to your site for more. Communicate your inbound goals and timelines with your sales, IT and executives – proper communication allows for cross-functional teamwork and highlights the benefits of inbound marketing to your team. Be consistent with your communication, whether it’s weekly meetings or just a casual check in. Now that you have some ideas and campaigns in mind start getting them up and running! Once you have implemented these tactics, you can start collecting metrics and generating reports. You will start to see what didn’t work, what is working and start thinking of how you can make future campaigns more effective. Sierra Calabresi is a former New Breeder.